This simple ornamental Kiddush Cup with Blessing over Wine set includes both the cup and saucer, and features elegant craftsmanship with intricate engravings on both pieces, making it a perfect addition to any Kiddush cup collection. 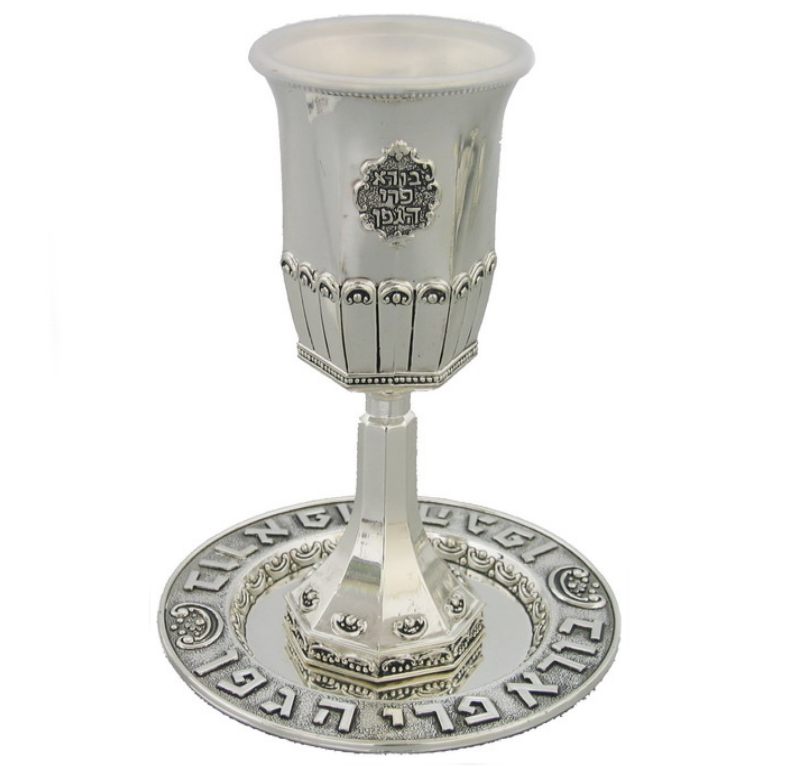 Perfect for the reciting of the Kiddush for Shabbat and certain holiday meals, this beautiful and Simple Silver Plated Ornamental Kiddush Cup with Blessing Over Wine set features gorgeous Judaica engravings on both the cup and saucer that reads "borei pri hagafen." The intricate engravings and design of the cups makes it suitable for special Shabbat and holiday occasions, but versatile enough for anytime a Kiddush cup is required. The Hebrew word ""Kiddush"" translates to sanctification, and is the name of the special blessing that is recited over either wine or grape juice inside the cup. When the Kiddush passage is done being spoken, the reciter drinks from the cup and then passes it along to the other participants in the room, who then take turns drinking from it as well. Kiddush can occur on the Friday evening before the Shabbat meal, the following morning and afternoon, and the eve and morning of certain Jewish holidays as well.